Ok, so they have a new name, but deep down we all know Kyuss Lives! 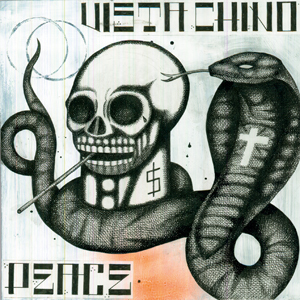 It’s just in another form called Vista Chino and the new album is called Peace. 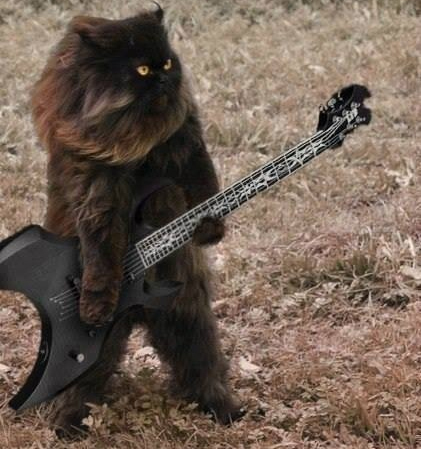 Where that band name came from I have no clue and trying to translate it doesn’t really make sense. One thing is for sure, you are unlikely going to forget it. The legal battle over Kyuss Lives! is over and the result was the guys had to change their name. This is their first output under the new moniker, but if you are including time served as the one and only Kyuss, it’s been a wicked long time…about 18 years since we’ve heard new material. Current full-time membership in Vista Chino is John Garcia on vocals, Bruno Fevery on guitar who also played live shows with Kyuss Lives! Lastly, Brant Bjork is on drums. Mike Dean plays bass while touring and is not listed as a permanent member. Fomer Kyuss members were in and out during the recording process for Peace, but the final version, so far, is what you see above. While my days of burning doobies is behind me for the most part, the music that I loved to listen to while flying high stuck with me. Due to massive amounts of psychedelia rock/metal with those trippy elements gets labeled as stoner rock/metal, but I find that the music is highly enjoyable even without the aid of certain naturally occurring plants that are dried and lit on fire for recreational purposes. The 3 biggest names that get dropped when referring to the pioneers of the style are Kyuss, Monster Magnet, and Sleep. All 3 bands released their debut albums at around the same time, so it’s difficult to say which one was the true originator. But since they each offer a much different sound from the other, let’s just say they all share the pioneer honors. Eventually Kyuss and Sleep broke up as members of the bands went on to form bands like Queens of the Stoneage and High on Fire and Monster Magnet gradually drifted away from the heavy psychedelic sound in lieu for a more hard rock focus (they still do retain a lot of their original trippy sound though). So, of the 3 which one appeals to the THC drenched part of your metal heart the most? Enjoy!! While April 20th may be tied to the anniversary of the horrible Columbine High School shootings and Hitler’s birthday, it is also a date tied to some great things as well. Such as the always humorous and infinity inspiring George Takai’s birthday. It is also the stoner’s favorite day of the year. 4 20 is the ‘unofficial’ International Day of Marijuana. And before I go into a long diatribe on how there’s more benefits to pot than negatives, I’ll just leave it at, as long as it is use responsibly and don’t force or pressure it upon those who don’t want to partake, there is nothing wrong with partaking in a little bit of the green. So in celebration of this ‘unofficial’ holiday, the Video of the Week comes to you by the pioneering stoner rock/metal bands Kyuss and Monster Magnet. Kyuss‘s downtuned and sludgy riffs paired with hypnotizing rhythms made for some great music to zone out to whether you are under the influence or not. Welcome to Sky Valley is considered a musical masterpiece by fans and critics alike, and I am in total agreement with that. Blue for the Red Sun is another phenomenal record by them also and well worth listening to if you want some rocking tunes to zone out to. Considered just as much of pioneers in stoner metal/rock is NJ’s Monster Magnet. While Kyuss had a more modern edge to their music, the Jersey boys took a more classic psychedelic rock approach. Their earlier albums Spine of God, Superjudge, and Dopes to Infinity are lauded as the bands finest work as band mastermind Dave Wyndorf explored musically every corner of ‘tuning in and dropping out’. On Powertrip and beyond the band took a turn away from their psychedelic roots for a heavier hard rock/metal approach but still kept they out of this world, trippy lyrics they were famous for and still injected plenty of ‘experimentation’ into their music to continue to be considered a top of the line stoner rock/metal band.